The genusPlebeia has a special significance for the study of social evolution of stingless bees: morphologically primitive, its species display a wealth of behavioural evolution, especially with respect to the oviposition process. We comparePlebeia remota with the few other members of the genus studied so far. Related to its subtropical geographical range, brood production is seasonal (there is no brood in the colony in colder months), and adult workers occur as summer and winter bees. The nest is in tree cavities, and the involucrum is absent or restricted to the winter period. Brood cells are arranged in horizontal combs, and new cells are built completely synchronously. Each series consists of up to 50 cells, their number being mainly dependent on colony size. Construction speed is remarkably constant, allowing 4–6 batches per 24 hours. Cell building and provisioning are activities of a small group of specialized workers. The oviposition cycle follows the classical subdivisions for stingless bees. During the patrolling phase a worker may “offer” a trophic egg in a most remarkable way: while retreating backward from the queen she bends the abdomen under thorax and head, and lays an egg on the comb. This egg is eaten by the queen or a worker. The provisioning, oviposition and operculation of all cells occur simultaneously, each cell is provisioned by 4–9 workers. Localization of a cell by the queen may be facilitated by its characteristic guard, which “defends” the cell against the approaching queen. The degree of synchronization within a batch is very high: the duration per cell lasts 420–950 sec, the batch of up till 50 cells needs only 557–1160 sec. Operculation is done by a worker that was not involved in the previous steps. Males are generally produced by the queen. Several male producing cycles per year occur. In orphan colonies laying workers give rise to males, and in queenright colonies workers may occasionally reproduce as well. 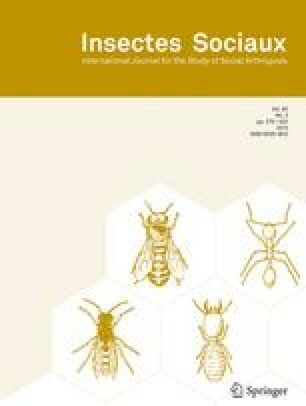 Division of labour follows the general pattern for stingless bees; however, cell building and provisioning are activities of a specialized group of workers.